BE ONE OF THE BEST! The program starts in October. Applications are accepted now! SDA Bocconi, business school No 7 in the world, and the American University in Bulgaria, No 1 in business administration in Bulgaria, present a unique educational opportunity. Join an elite Executive Master’s program and immerse yourself in an exciting and supportive learning environment! Choose the joint program of SDA Bocconi and AUBG in Sofia for your Executive Master’s degree and prepare for a successful career and fulfilling professional growth. Learn from internationally-renowned academics and harness your personal potential. The Executive Master in Finance, Banking & Real Estate (EMFBRE) prepares you to offer high quality solutions in a variety of ﬁnancial, banking, and real estate situations both operationally and strategically. The program focuses on theoretical and practical knowledge, critical and analytical thinking, and problem-solving skills, while emphasizing on key corporate culture elements: a ﬁne blend of leadership and respect for others, ethics and appreciation of diversity, values and solidity. 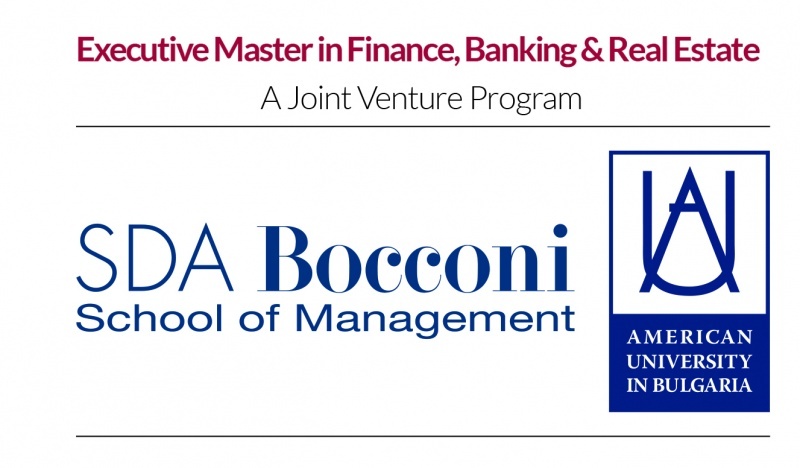 A 16-course part-time & post-experience program, delivered in conjunction with the SDA Bocconi School of Management. Highly interactive courses, aiming to bridge the gap between theory and practice. Be one of the best with the elite Executive Master in Finance, Banking & Real Estate. 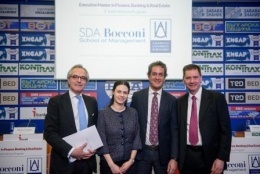 Bocconi was twice the starting point of my career and a constant reference point. I often took my fellow students and professors as a benchmark to refer to and confront towards my professional development. Bocconi shapes the knowledge and values of innovators and future leaders. As a student I understood that tomorrow's great achievers need more than qualifications. I needed confidence, vision, and a strong set of values which I found in Bocconi. Bocconi students are respected around the world for their values, experience, understanding and leadership. Bocconi historic focus on developing more than just academic skills helps students to collaborate and drive change. Bocconi produces confident, adaptable graduates who are ready to take on the challenges of our global society.